First and foremost, a good pair of snowboarding boots should get you down a slope safely and with a good measure of comfort. But Nike also wants you to be noticed, particularly if you're competing and need to impress a bunch of judges. 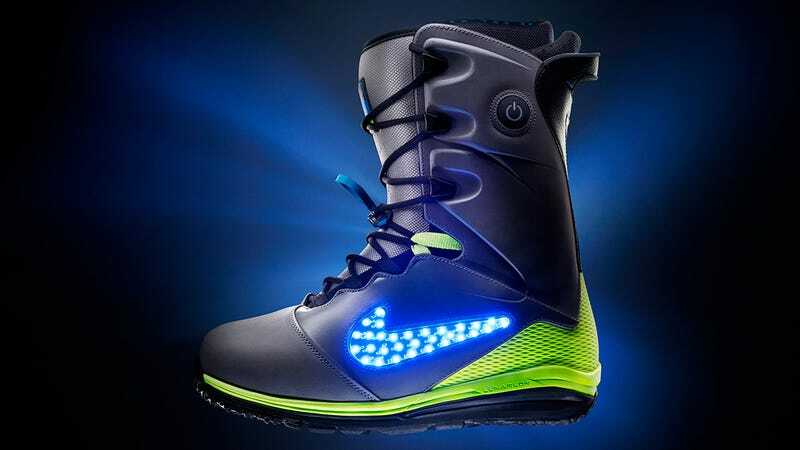 So with its latest snowboarding boot—the LunarENDOR QS—Nike's enhanced its iconic swoosh logo with 30 glowing LEDs so that when you're pulling a spiralling Double McTwist 1260, you'll be an impossible to miss swirl of blue. The LEDs are powered by a lithium ion battery activated by an on/off switch on the boot's cuff, so yes, the boots are yet another thing you'll need to charge every night—but they're not all about being flashy. The LunarENDOR QS also features what Nike calls an internal flex line system which allows the wearer to dynamically adjust the stiffness and comfort of the boot for pulling tricks on a half-pipe, or leisurely cruising down a mountain.